The event also highlights the importance of hiring professional roofing contractors and making educated decisions about maintaining or replacing any roofing system. During National Roofing Week, NRCA hosts an annual children’s art contest, sponsored by A.C.T Metal Deck Supply and the International Roofing Expo® (IRE). Children related to NRCA members and employees are encouraged to submit their artwork. 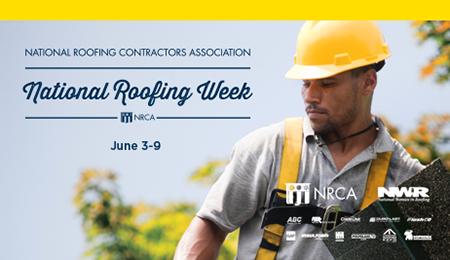 In addition, NRCA members and staff bring National Roofing Week to their own communities by making contributions to local charitable organizations. In that same spirit, Seaman Corporation, parent company to FiberTite, recently kicked off a campaign to raise money for the local Habitat for Humanity — organizing a pig roast and basket raffle as well as a bowling night fundraiser (on Saturday, June 2). Associates will also be participating in a build day on Saturday, June 9, to help construct a new Habitat for Humanity home. The homes the organization builds are sold to partner families, and, locally, nearly 70 homes have been built to support the community. Seaman Corporation is proud to support this cause. At FiberTite. we believe in providing our expertise where it’s needed most. As experts in the roofing industry. We go above and beyond to provide meaningful industry information to the community through our blog, whitepapers and other educational content.